There is a restaurant that has something to do with olives and gardens. This restaurant makes amazing breadsticks. No, it's not a riddle, I don't want to pay the restaurant for using their name. I will just call them the Grape Garden. If you want to make it sound fancy, we could call them the Oliven Garten. No? Fine. My Mom decided to make a copycat Grape Garden dinner one night. She made salad dressing, salad, pasta, and breadsticks. 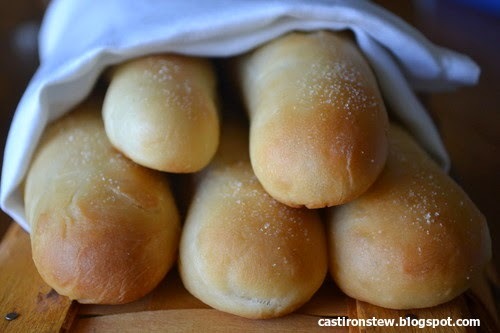 Wonderful, delicious breadsticks. In your electric mixer, whisk the water, yeast, and 1/2 tsp. of the sugar together until the yeast is dissolved. Allow the yeast to rest for 10 minutes. After the yeast has rested, add the rest of the sugar (1 Tbsp. and 2 1/2 tsp. ), half of the flour (1 1/2 cups), salt, and vegetable oil. Put the paddle attachment on the mixer and mix the mixture (ha-ha!) until well combined. Switch the mixers paddle attachment with a dough hook, and add in the remaining flour (1 1/2 cups). Kneed the dough on low speed until the it is smooth and elastic. You may have to add up to 1/4 cup of flour. The dough should pull away from the sides of the bowl, but it should still be a little bit sticky. Butter a large bowl. Transfer the dough to the bowl and cover with plastic wrap. Allow it to rise in a warm room for about 1 1/2 hours, or until it has doubled. Grease two cookie sheets. Punch down the dough, and then divide it into 12 equal portions (approximately 2 ounces each). Lightly flour your work surface. Keep the idle portions covered with plastic wrap as you roll each piece into a 9 inch rope. After you roll each piece, move them onto the cookie sheets. Cover the cookie sheets with plastic wrap. Let the dough rise for an hour in a warm room. During the last 10 minutes of rising, preheat your oven to 425. Bake the breadsticks for 11-13 minutes until golden. For a golden crust, you can broil yours for the last minute. Meanwhile, mix the salt with the garlic powder in a small pinch bowl. When the they come out of the oven, spread the butter on them and immediately sprinkle the salt/garlic mixture over the tops of the breadsticks. Thanks, Cooking Classy, for letting me use your recipe!